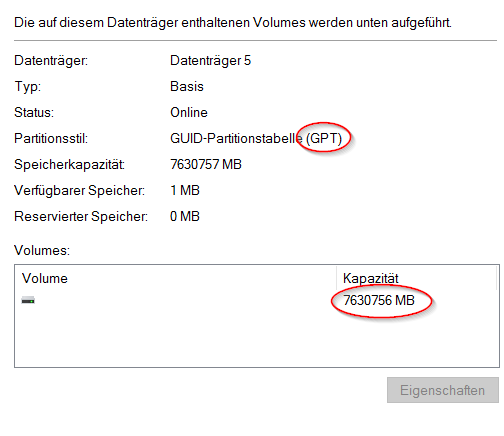 Partition 2: GPT, 7451 GB. 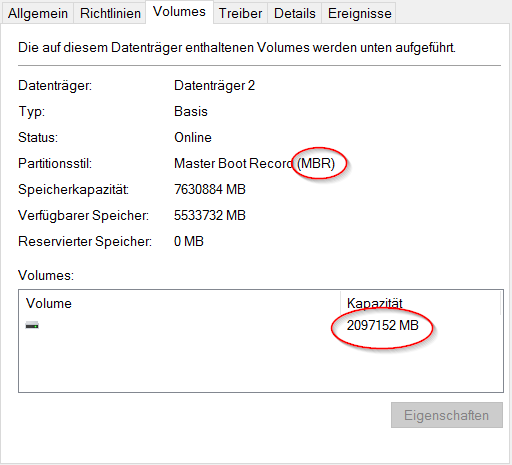 Partition 1: MBR, 2048 GB, Protective Partition. When put the drive back into the USB case, all works fine. How can I force Windows to recognize the hard drive type as GPT? Setting the partition type id with a tool like Partition Wizard, doesn't make sense, because the drive which holds the partiton, is recognized as MBR. Of course I dont't want to reformtat it, because it holds a prtition with data. Software like Active Partition Manager stops on a convert to GPT action with: "Unable to convert GUID Partition Table. Impossible to place partitions outside of target area on devices having GPT". Any idea why its not possible to operate my drive internal? Browse other questions tagged windows-10 hard-drive mbr gpt veracrypt or ask your own question. Factory 2TB GPT disk with 16GB in unused partitions. Is this right? Windows 10 Tech Preview error: “Windows cannot be installed on MBR disks”. My hard drive is GPT. Why am I getting this error? Bootcamp Windows 10 in Legacy BIOS mode reports external pure GPT disks as MBR. Why?